Chhath (छठ) is an ancient Hindu Vedic festival historically native to Bihar-Jharkhand and Eastern Uttar Pradesh of India and the Madhesh of Nepal. It's mainly origin was in Bihar The Chhath Puja is dedicated to the Sun and his wife Usha in order to thank them for bestowing the bounties of life on earth and to request the granting of certain wishes. Chhath Puja festival is observed by Nepalese and Indian people, along with their diaspora. Chhath Puja considered as the god of energy and of the life-force, is worshiped during the Chhath festival to promote well-being, prosperity and progress. In Hinduism, Sun worship is believed to help cure a variety of diseases, including leprosy, and helps ensure the longevity and prosperity of family members, friends, and elders. Chhath Puja festivities span across four days and are observed to worship the Sun god and seek his blessings for the overall prosperity of the family. The fervour around the puja is marked by offering prayers to the Sun god, fasting and taking dips into the holy waters of Ganga (however, with time people have evolved and become less rigid about this rule). The grandest festival for those who observe it, Chhath Puja is also a stringent one that encourages frugality and abstinence from food and water. The festival is celebrated as a thanksgiving to the Hindu God of Sun. A devotee who observes a fast during chhath is called vrati. Devotees are expected to fast for four days. 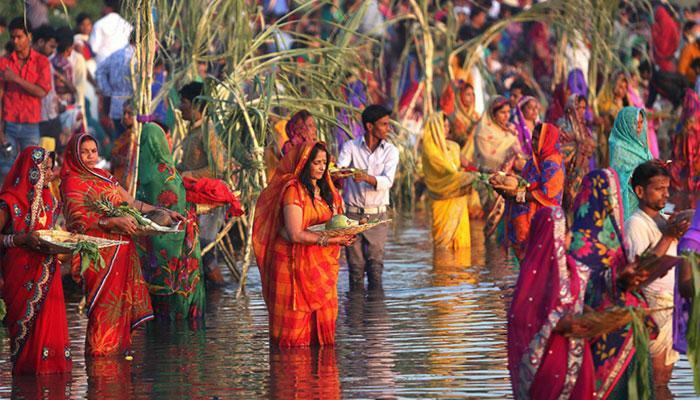 Chhath puja involves devotees praying at the riverbank during sunrise and sunset. Scientifically, the solar energy has lowest level of ultraviolet radiations during this time, which makes it beneficial for the body. The first day - nahai khai - starts by taking a dip in holy Ganges or by sprinkling ganga-jal (holy water) and worshiping the Sun God after which kaddu-bhaat (pumpkin curry and rice) along with channa dal is prepared and eaten. On the first day, devotees abstain from eating, apart from the morning meal, until the next day's evening (kharna) where they eat kheer, chappatis and fruits. The second day is known as Lohand. The third day is called pehla argha/saandhya argha. Those on a fast, completely abstain from eating anything on this day. The sinking sun is worshiped and given offerings (argha) in the evening. The final day - doosra argha/suryoday argha - sees devotees giving argha and worshiping the sun early in the morning post which devotees break their fast (paran) by consuming the Chhath Prasad including kheer, sweets, thekua and fruits. Rice, wheat, fresh fruits, dry fruits, coconut, nuts, jaggery and dollops of ghee go into the making of traditional chhath meals as well as Chhath Prasad. Meals during chhath - especially the Chhath Prasad - are prepared strictly without onion, garlic and salt. Some devotees may use rock salt. The festival also marks the celebration of the new harvest. The offerings given to SuryaDevta include fruits and food preparation made with this fresh harvest.